A truly unique waterfront holiday accommodation. 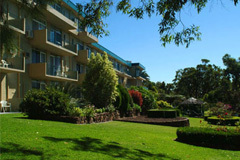 Located on 3 acres of landscaped gardens, Salamander Shores Hotel Port Stephens is only minutes from Nelson Bay and is the perfect accommodation for a relaxed holiday. Guests can indulge in a plethora of outdoor activities like diving, snorkelling and trekking nearby. The Salamander Shores Hotel offers 90 rooms and suites that are well equipped with a host of modern amenities, most with balconies offering fabulous water and garden views over the pristine waters of Port Stephens. While serving an array of international and local favourites, the restaurant features a menu of fusion specialties. The bar is situated beside the restaurant and serves wide varieties of beer, spirits and wines. Guests can relax at the spa or at the refreshing swimming pool all day long. The new Shores Bar and Brasserie is open from 7.00am daily serving breakfast, lunch and dinner. Drop in for a coffee, cocktail, cold beer or sample one of our wines. Alfresco dining and a large grassed beer garden with new children’s playground make it the ideal place to enjoy some fresh air, sunshine and beautiful garden and water views. Specialising in Port Stephens fresh seafood and sensational Prime Hunter Beef, come on in and enjoy professionally prepared quality food, within a friendly and relaxed atmosphere. The kids are most importantly catered for with $5.00 meals and we understand that if the kids are fed and happy, Mum & Dad are happy! Breakfast is a great way to start the day with a full hot & cold buffet selection available and has got to be the best value breakfast in the Bay! Port Stephens offers ample adventures for the young and the young at heart. A trip to Port Stephens would not be complete without experiencing the white sandy beaches and the famous Coastal Dessert Wilderness of Stockton Bight. The Port Stephens waterways are truly spectacular with abundant marine & wildlife. Resident dolphins, whale migration, famous fishing grounds and marine park. Located on the Soldiers Point peninsula, only minutes from Nelson Bay Salamander Shores Hotel is the ideal base for your next holiday.